Charm symbols first began to appear on some Chinese coins during the Han Dynasty (please see Emergence of Chinese Charms). Most coins of that period were round with a square hole in the center. As charms began to develop independently of legally circulated coins, most continued to keep the familiar coin shape. However, some Chinese charms gradually began to appear in forms other than the common coin shape. For example, there are charms shaped like locks, fish, peaches, gourds, etc. One of these most distinctive forms is based on the shovel (spade) or bubi (布 币) money of ancient times. An understanding of the history of this ancient money form is helpful in explaining the eventual appearance of the spade shaped charms. 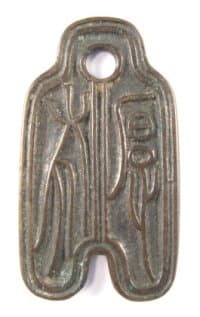 Spade shaped charms imitated a very ancient form of money. 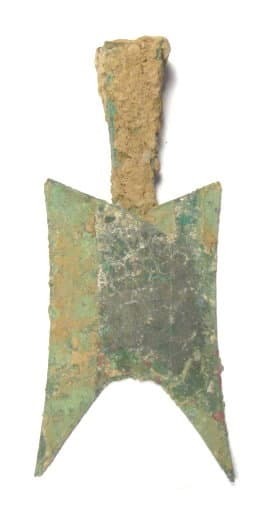 During the Zhou Dynasty (11th Century BC - 221 BC), some of the first forms of money evolved from an ancient farming tool that were shaped like small shovels or spades. These forms of money were called bubi (布币). 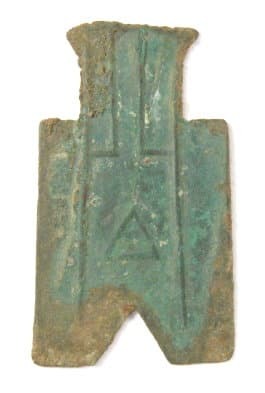 This is one of the very oldest examples from my collection of shovel or spade money from the Zhou Dynasty. There are no Chinese characters on it and the top is hollow as would be the case with a real shovel where you would insert a wooden handle. This type of pointed shoulder spade money was cast during the years 500-400 BC. This piece is approximately 142 mm in length and 66 mm at its maximum width. The actual weight is hard to determine because the hollow top portion is still packed with earth from having been buried. During the later Zhou Dynasty, spade money gradually evolved into a form having less pointed legs while still retaining the hollow top. Very primitive Chinese characters also started to appear and the overall size decreased. 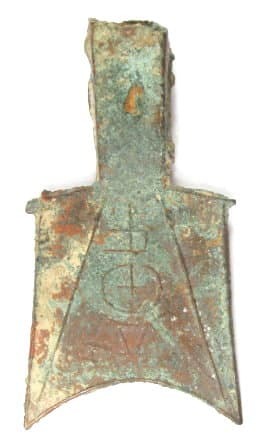 This is an example of such a later Zhou Dynasty shovel piece having the Chinese characters lu shi (卢 氏). This piece was cast by the Kingdom of Zhou during the period 400-300 BC. This spade specimen is approximately 88 mm in length and 48 mm at its maximum width. Its true weight is difficult to determine because the hollow top is still packed with earth. During the Warring States period (475 BC - 221 BC) at the end of the Zhou Dynasty, various states produced spade money which were much smaller in size. The money was also flat so there was no hollow top. The legs became much less pronounced. This is an example of spade money from the Warring States period having the Chinese character gong (公). 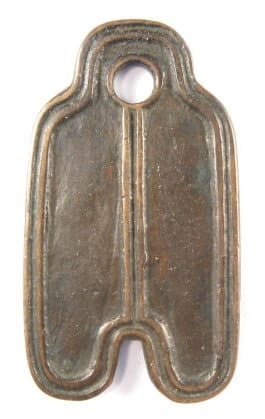 This square foot spade was cast sometime during the period 350-250 BC. This specimen of spade money is 48 mm in length and about 28 mm in maximum width. The piece weighs about 5.2 grams. When Emperor Qin Shi Huang conquered the warring states and unified China for the first time in 221 BC, he eliminated the various forms of existing money and established a round coin with a square hole, known as the ban liang (半两), as the monetary standard. (Please see my introduction to Chinese charms for more historical information). The early Han Dynasty that followed continued to use ban liang coins for a period of time and then adopted the use of wu zhu (五 铢) coins. To see ban liang and wu zhu coins with distinctive symbols and features, please visit Emergence of Chinese Charms -- Symbols Begin to Appear on Chinese Coins. During the short reign (7 - 23 AD) of Wang Mang, spade money was again cast. 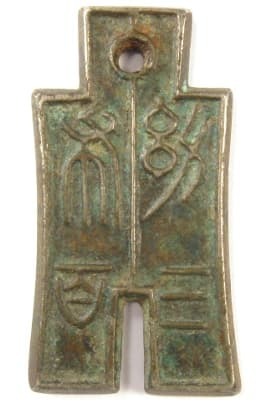 This is an example of the spade money (huo bu 货布) cast in 14 AD during Wang Mang's reign. The Chinese character on the right is huo (货) meaning money and the character on the left is bu (布) meaning spade. You can observe the similarity to the spade money cast during the Warring States period. A major difference is the addition of the hole at the top. This specimen is 56 mm in length and 22 mm at its maximum width. The weight is 10 grams. This is another example of spade money cast during the years 10-14 AD of the reign of Wang Mang. The Chinese characters in the inscription are read in the following order: top right, top left, bottom right, bottom left. The inscription (legend) is you bu san bai (幼布三百) which translates as "Juvenile Spade, Three Hundred". This denomination of spade money was equivalent to 300 of the wu zhu (五铢) coins. This spade is about 39.6 mm in length and has a maximum width of about 21.5 mm. The weight is 10.6 grams. One of the more distinctive shapes of Chinese charms is based on Wang Mang's spade money. This is the obverse side of an old Chinese charm based on ancient shovel or spade money. As can be observed, it is very similar to the spade money cast during the reign of Wang Mang. The two Chinese characters are written in a very old style. In fact, there is disagreement as to what their meaning is. The character on the right is similar but still quite different from the huo (货) on the Wang Mang piece above. Some experts believe the character is actually hou (厚) meaning "thick" or "kind". The character on the left is also similar but different from the bu (布) on the Wang Mang piece. The true meaning of this charm may be lost in history or, perhaps, its creator was simply displaying artistic flair. The length of this charm is slightly more than 46 mm and its width is a little greater than 26 mm. The charm weighs 15.1 grams. This is the reverse side of the spade charm. The major feature is that, like the obverse side shown above, it has a double line rim on its outer edge and down the center. The Wang Mang piece upon which it is based uses only a single line for its rim and center line.